Did Bob McDonnell Establish Ethics Commission? | Virginia Right! Politifact has published their verdict of Virginia Governor Bob McDonnell’s campaign promise to establish an entity to oversee ethics issues and violations and concluded that McDonnell has broken that promise. So when it comes to policing state government, McDonnell has opted for an inspector general’s office instead of an ethics commission. Then governor’s office said there’s no need to have two groups that overlap. But during his campaign, McDonnell pledged to establish both entities. So we rate this a Promise Broken. 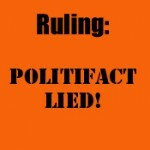 PolitiFact has, as is their pattern, distorted and twisted the facts to fit their left wing partisan agenda. Independent state ethics commission – Virginia is one of only 10 states without an independent ethics commission. Bob McDonnell will establish a permanent, statewide independent agency that will provide advice and research as well as evaluate complaints concerning elected officials and appointees to boards, commissions and other public bodies. There is nothing in this statement that in any way lays claim that there will be an agency created that is solely responsible for ethics investigation and only ethics investigation. Indeed, additional responsibilities are clearly stated in this promise “that will provide advice and research as well as evaluate complaint”. Governor McDonnell created an Inspector General office that fulfilled both his promise to create such an office and this office has been granted broad powers to investigate ethics complaints as well. PolitiFact has previously acknowledged McDonnell fulfilled his promise to create the IG office. But Governor McDonnell did what the liberals at PolitiFact cannot comprehend. He managed to kill two birds with one stone. By combining the two promises into one office, he has managed to both fulfill his promise and maintain the efficiency that has turned the massive Tim Kaine deficits into a surplus. Instead of an unfulfilled promise, the Governor has actually kept two promises and saved the taxpayers a lot of money. We rate this PolitiFact rating as a LIE.